The Boston Red Sox have put together a historic season in 2018. In their 117 year history, they have never won as many games in the regular season as they have this year. Their roster is loaded with two MVP candidates in Mookie Betts and J.D. Martinez as well as a Cy Young candidate in Chris Sale. They sent six players to the All-Star game on their way to running away with the AL East and posting the best record in MLB. 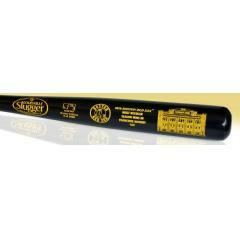 To commemorate this historic season, we are offering an official Louisville Slugger black maple Red Sox roster bat. This 34" full-size bat comes laser engraved with the Red Sox logo, the final regular season win total, an artist's rendering of Fenway Park, and the Red Sox roster on the back of the bat. The bat comes with a double coat of lacquer which results in an incredible shiny finish when displayed. With only 5,000 bats being made, we are expecting a sell out so order yours before they are gone!